On Sunday the 20th I went to church with Grandma & Grandpa Herbert. 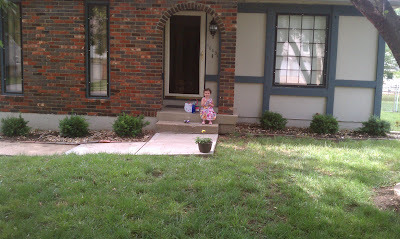 While we waited for G&G H to come pick me up, I asked Mom if we could wait outside and enjoy our new bushes. They're still little but I'll keep and eye on 'em and make sure they grow big and strong. I say "I" because my parents can't be trusted to keeping anything else alive. I think they've maxed out with my sisters and I.... hope the Peanut doesn't need to much help in that department. That afternoon we went to a Welcome Back party for M&D's friend Jason. It was over at my buddy Maddie's house and we all know what that means - toys that are new to me! I also hung out with some of my older friends too. Ms Kim and I played ball in the yard and despite how promising this pic looks, I did not catch this ball... or any other for that matter. Makes for good photos though right? 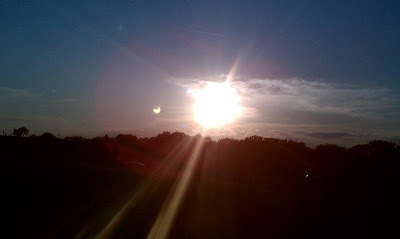 Unfortunately our timing was awful and we left just as the solar eclipse was happening. Dad took dozens of pictures... from his old cell phone... from a moving car. I'm not sure what he was expecting but he actually got an interesting pic. Obviously the sun was too bright to see anything directly but somehow there was a refraction and you can actually see a small version of what the eclipse looked like (small image to the left of the sun - click to enlarge.) Kinda cool, eh? Of course if you Google for 2012 eclipse pics you'll see a lot of cool shots like this one. 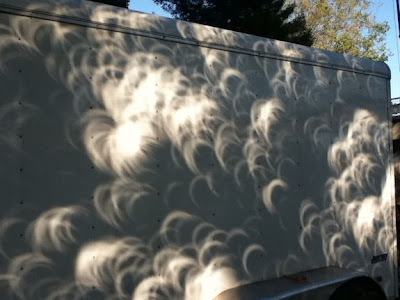 It's a picture of the eclipse against a trailer. Given the number of eclipse images, I'd guess it's reflecting off of some water. Slightly cooler than Dad's cell phone shot eh?